Wesley Holt, retired marine and current employee of Langford and Lovejoy, makers of custom furniture, a firm that consists almost solely of veterans, has found a measure of contentment in Perfect, Indiana. He likes his job, and he has found good friends in the small town. He is dealing with his PTSD, and if his ex-wife’s cheating ways have led him to put his heart in cold storage, well, he can live with that. At least he has a rich fantasy life starring Carlie Stewart, his favorite waitress at the Perfect Diner. Kara Hague was a runaway and a drug addict at sixteen, but she has been straight and clean since just before she turned eighteen—seventeen years ago. However, she made a bad choice when she married a man she met at a Narcotics Anonymous meeting whose commitment to recovery failed to match hers. When she almost died at his hands, she helped put her drug dealing husband behind bars, divorced him, and had his parental rights terminated. Four years later, she has legally changed her name to Carlie Stewart, and for the past two years, she and her six-year-old son, Tyler, have been residents of Perfect where they have built a new life. Carlie works at the Perfect Diner and counts the arrival of Wesley Holt for breakfast at the diner as the highlight of her day. When Carlie fails to arrive for work one morning, Wes volunteers to check on her for her concerned employers. When he and his dog Rex, also a war veteran, arrive at Carlie’s home, Wes discovers a battered Carlie being held at knife point by her ex who has escaped from prison and tracked Carlie down to kill her and kidnap his son. Wes rescues Carlie and Tyler, but her fugitive ex escapes. Wes insists that Carlie and Tyler move into the guest quarters of his high-security apartment on the third floor of the Langford and Lovejoy building until her ex is captured. The more time Wes spends with Carlie and Tyler, the more deeply in love he falls with them and the family the three of them become. Carlie and Tyler feel safe with Wes, a powerfully seductive emotion given their reality, and Carlie learns that Wes in his strength and tenderness is all she dreamed he was and more. But the threat of Carlie’s ex lingers, and both she and Wes carry heavy baggage from their pasts. Can they defeat the flesh-and-blood villain who is a real and present danger and the demons that haunt them both? Can they find the different kind of courage it takes to risk their hearts on love and all it promises? 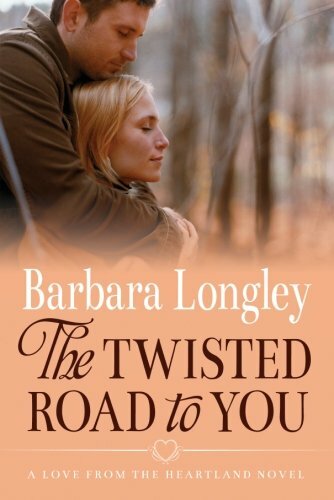 The Twisted Road to You is the fourth book in Longley’s Perfect series. All of the books in this series pack a heavy emotional punch as wounded characters find the courage to fight for their happiness, but this one may take the prize for the most angst-ridden story and the most rewarding HEA. Wes and Carlie both are survivors scarred by battles physical and emotional, and they are uncertain that they deserve love. Tyler is endearing and vulnerable and as hungry as his mother for the kind of attention that Wes gives so lavishly. All three characters engage the reader’s affection and sympathy, making it easy to root for them to find happiness together. The threats to the HEA, both external and internal, are real and keep tension high. Fans of the series will enjoy the appearances of characters from the three previous books, but Longley provides sufficient details for this book to be read and appreciated on its own merits. The first book in the series, Far from Perfect (2012) is one of the rare books that I bought based solely on cover copy, with no recommendation from friend or review site. I’ve been hooked on the series ever since. If you are a fan of military heroes, small-town settings, or romances that tug at your heart strings and leave you cheering at the HEA, I recommend this book. I am a fan of military romance. Just finished Marilyn Pappano's latest, Chance of a Lifetime. I have one of Barbara's books on my tbr; will have to check out the others in the series. Did not realize it was a series. Thanks for the heads up. Never heard of her. Will have to check her out. Love military romance novels.